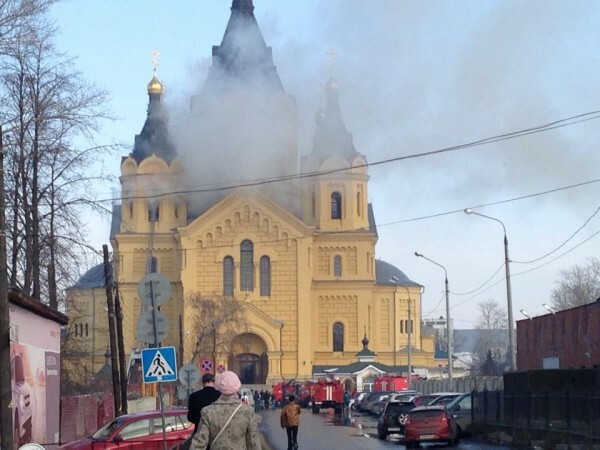 Nizhny Novgorod, March 12, Interfax - Firefighters are battling to extinguish a blaze that broke out at the Saint Alexander Nevsky Cathedral, located in the Kanavinsky District of Nizhny Novgorod. The city’s emergency services were alerted about the fire at 11:12 a.m. Moscow time, the Nizhny Novgorod branch of the Russian Emergency Situations Service said on its website. “The first firefighters who arrived at the site observed plumes of smoke billowing from the third floor of the building. This information is being verified,” it said. The building of the city’s old cargo river port and the headquarters of a local traffic police unit are located near the cathedral.